083.Ana Carvalho – JavaMuseum 2010 – Celebrate! develops work between live visual performance/installation and Internet, uses images and colours to explore multiplicities in feelings, gender and relationships. used technology (software etc): HTML, Flash. Diaries Book is a celebration of daily life, women’s achievements, fictional biography and areas of knowledge where empiricism is as important as experimentalism. Each one of us is not the same all of the time. We are different to different people in different circumstances. 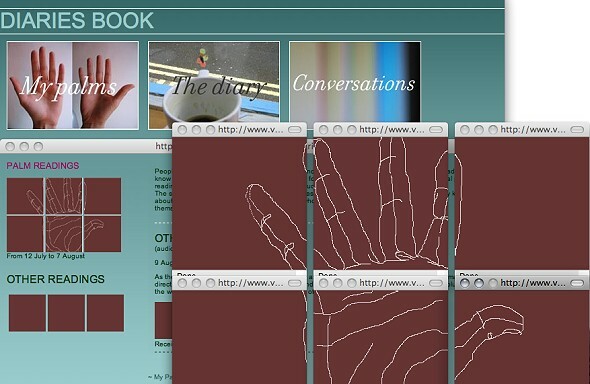 Diaries Book documents the process of knowing the author from other people’s perspective through palm readings, and from the author’s self perspective, through a diary. The idea for Diaries Book is inspired by the work of the Japanese author Murasaki Shikibu, who mixed daily life with fiction to create the first ever written romance called The Tale of Genji.